Are there enough clinical academics in the UK? If not, how do we increase the number of these staff? And how do we ensure these staff have the resources to carry out research? There are a number of factors involved in all of these questions, involving a range of organisations and funding streams, and further research may be needed. However, there is already work going on in the academic community which looks at some these issues. There seems to be a growing consensus that one of the most common ways that we are inspired to follow a career is through role models. As the Survey of Dental Clinical Academic Staffing Levels highlights, it’s important to raise the profile of clinical academics like Professor Jimmy Steele, who have had an exciting career with far reaching influence on healthcare and government dental policy. It’s also important that support continues for mentoring schemes for early career staff, such as through programmes run by the Academy of Medical Sciences. Dental schools are run by clinical academics and they help to inspire students throughout their studies. Schools have also set up a range of INSPIRE schemes, supported and funded by the Academy of Medical Sciences and the Wellcome Trust. The Dental Schools Council are very supportive of this scheme and schools have seen fantastic results in the views and inspiration of dental students to carry out research. For the past two years, King’s Dental School in London has hosted a one-day INSPIRE conference, inviting students from around the UK to learn more about a career in clinical academia, with talks from inspiring leading academics and to invite students to present their research. Plymouth University Peninsula Schools of Medicine and Dentistry along with three partner universities – Bristol, Cardiff and Exeter universities – have established an INSPIRE Student Health Sciences Research Journal, going into its second year of publication. The Dental Schools Council welcomes the responses to this year’s survey for a greater increase in the number of dental clinical academics, such as in the recent Press Release from the British Dental Association. The Dental Schools Council calls on other organisations such as the British Dental Association to work together across the dental and academic community to help support and inform students and graduates about the range of careers available to them, including clinical academia. It’s important that students and graduates can gain access to this guidance across the range of information hubs they may use to make decisions for their future career. Although clinical academia is often mentioned as a possible career, there is further work to be done in terms of signposting and explaining the different routes, as well as the pros and cons of the various careers in dentistry. It is also the responsibility of all the various dental professional organisations to help promote the positive aspects of the clinical academic’s role in improving patient care by contributing to clinical research and educating the next generations of dental professionals. Another aspect that needs to be addressed in order to increase the number of clinical academics, is to ensure the career pathway is attractive and that there’s sufficient funding and support throughout the career pipeline. A key strategy that funders of clinical academia have sought to address this is via the recently published principles and obligations guidance. The National Institute for Health Research has been working in collaboration with other funders, the Medical Schools Council and other stakeholders to create this new guidance for UK institutions and clinical trainees in receipt of nationally competitive funding for clinical academic research training. The document is now being discussed by the funders, the Universities and Colleges Employers Association and NHS Employers amongst other relevant institutions, to look at the most effective way to implement this across the UK. This new guidance aims to ensure that employment benefits are maintained as staff move between the university and clinical practice employment. In the past, this has been reported as a key source of stress and anxiety for clinical academics, particularly (but not exclusively) for maternity rights: the drop in staff at middle-grade and of women may be related to these issues. Clearly, a perception of a potentially unstable career path may have had an impact on career decisions of dental graduates. A key part of increasing this staff group, of course, is also ensuring that there is a strong funding stream for dental clinical academia and to remove any barriers for enthusiastic, bright and able applicants to gaining an appropriate post. Over the past year, the Dental Schools Council has initiated a Priority Setting Partnership, facilitated by the James Lind Alliance. This process will involve patients and clinicians working together to identify uncertainties about healthcare interventions in order to prioritise research. Any individual or organisation will be able to take part in the initial survey which will scope out research needs. The Partnership is due to be launched at British Society for Oral and Dental Research in September 2017. The project aims to identify the key priorities for dental research, and it will hopefully enable further advancement of dental research at the cutting edge of healthcare needs. It also hopes to increase collaboration and interaction between researchers, funders, and research networks. 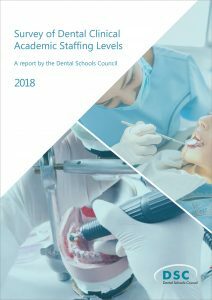 The Dental Schools Council report of staffing levels showed an increase in Clinical Teaching staff in recent years (by +63.1% since 2010), and thus concerns were largely highlighted about the drop in staff on research-active contracts (by -10.3% since 2010). While it is of course important to ensure there is a sufficient number of both teaching and research-active or ‘focussed’ contracts, it should be highlighted that clinical academics on research-active contracts also play an important role in teaching the future generation of dental students, as well as helping to inspire them to follow in their footsteps. In its most recent guidance for the dental team’s learning outcomes Preparing for Practice (2015), the General Dental Council states that ‘in order to effectively carry out sound evidence-based decisions dental professionals must understand the principles of good research practice’. The General Dental Council, and the educators meeting these standards, clearly recognise the importance of dental undergraduate teaching being carried out in research-rich environments. Research should remain an important component for employers, funders and all relevant stakeholders within the healthcare profession when considering the development of the dental workforce – of both trainers and trainees. The profession needs to work together to continue to raise the profile of dental research. For the full report see the Survey of Dental Clinical Academic Staffing Levels 2017, and for comparative discussions in medical clinical academia see the Survey of Medical Clinical Academic Staffing Levels 2017.